Today we'll learn how to draw Doraemon. This robotic "cat from the future" is an epic manga character in Japan and probably famous overseas too. I have lived in Japan for 23 years now and Doraemon is widely used not only in original manga motion movie series but also in children's book, etc. If I want to learn drawing manga I would probably begin learning how to draw Doraemon first. In Japan, every child and every adult, I mean absolutely everyone in this country knows Doraemon. That is something! Why the Doraemon story series is so popular and lasting for so long? All is because of its very positive and nice content. Simply everyone in Japan loves Doraemon. Children naturally want to know how to draw Doraemon. These stories content is very positive. Never aggressive in any way as many other cartoon characters and stories elsewhere. Kids are watching other cartoons and are getting violent. But violence or aggressiveness can never happen when your child watches Doraemon. That's the point, and that is the reason why its popularity level is still as good as new. 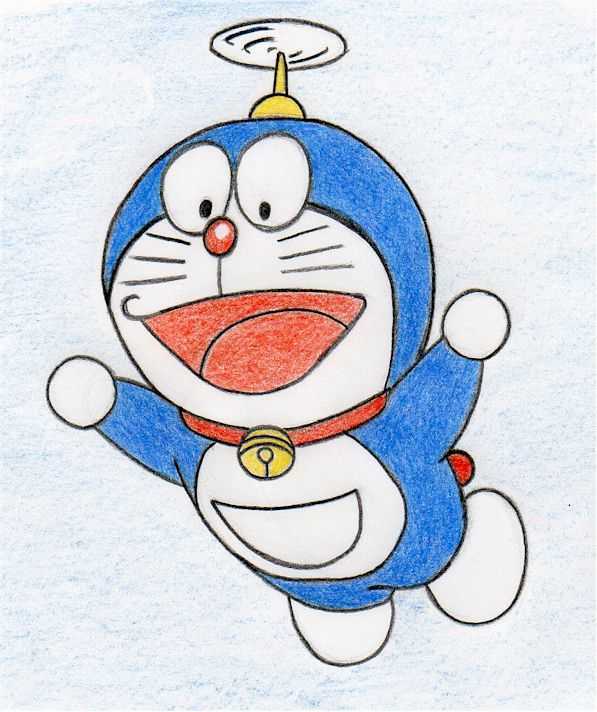 I believe you too somehow resonate with this very positive character and would love to know how to draw Doraemon too. 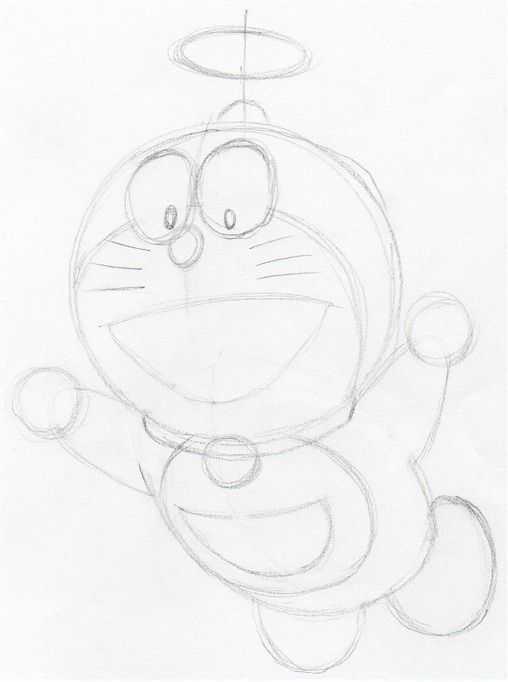 Observe well the finished picture of Doraemon and try to figure out in your mind how would you sketch it. Where would you start. 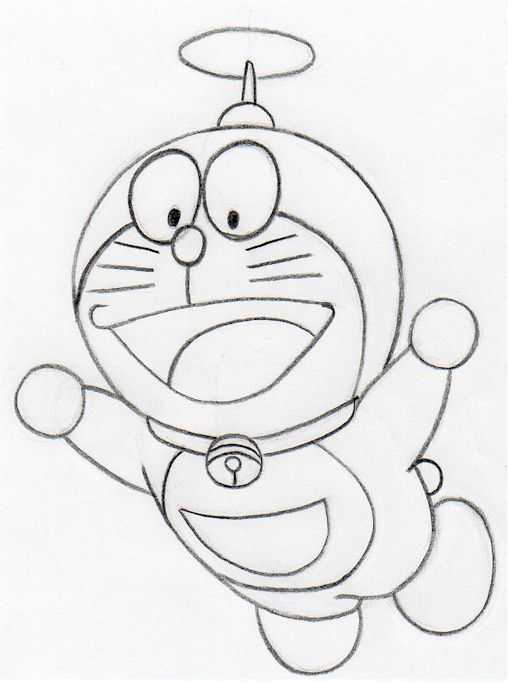 Doraemon is a very simply shaped character and therefore you will learn the drawing process quickly. 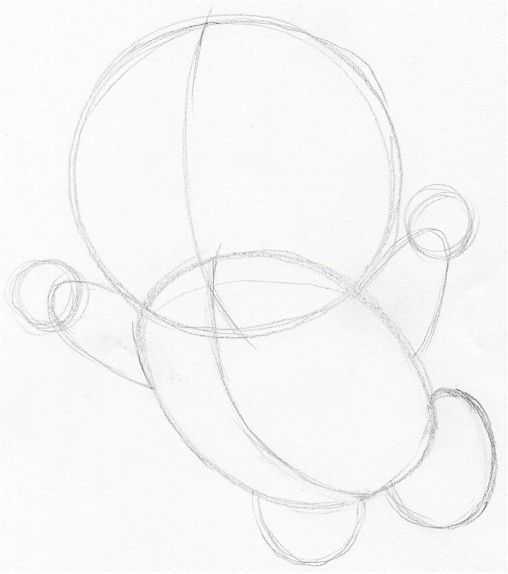 The circle is Doraemon's head and the ellipse is his belly. 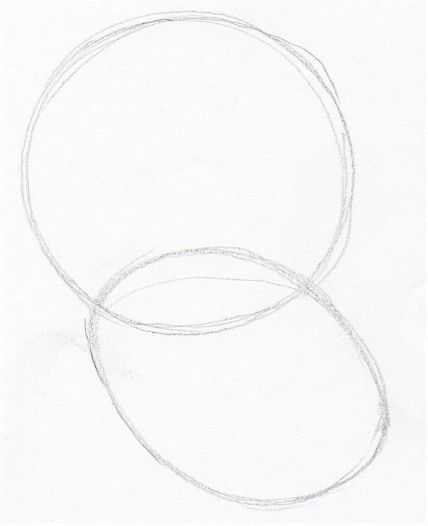 On both, circle and ellipse, sketch a center line, which will be your guideline to sketch other details precisely. Continue sketching the hands and the legs. All shapes are very simple, see that (? 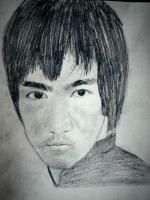 ), and you are able to sketch these parts very easily. 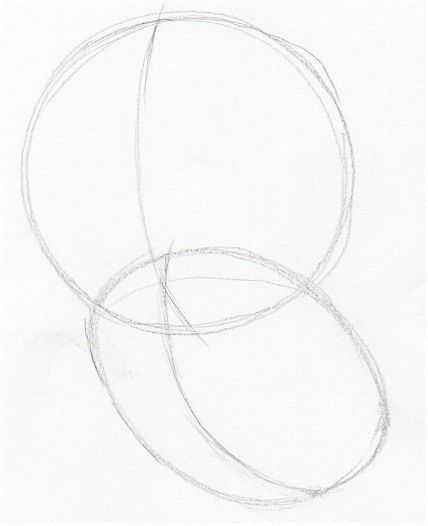 Here comes very helpful the center line you sketched in step 2. On the head circle outline the eyes and the opened mouth. 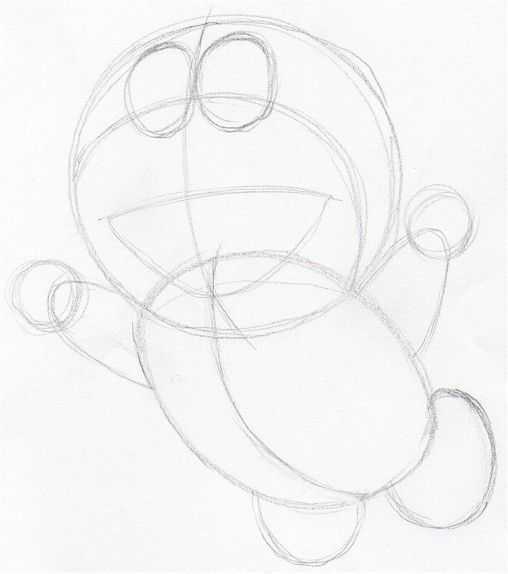 Sketch the nose and outline the belly circle and the "magic" pocket in it, as you see on this sketch. 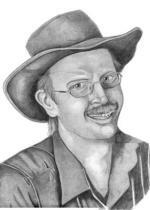 You can start erasing the initial pencil guidelines. A pen shaped eraser will come very handy now to help you ease the erasing work among many pencil lines. 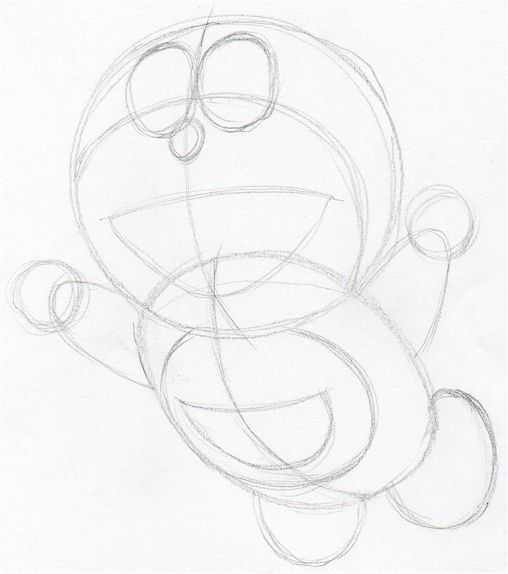 After erasing the unnecessary pencil guide lines you will get a rough sketch of Doraemon contours. In fact you've (almost) learned how to draw Doraemon by getting this step done. Sketch the "headgear" on Doraemon's head. 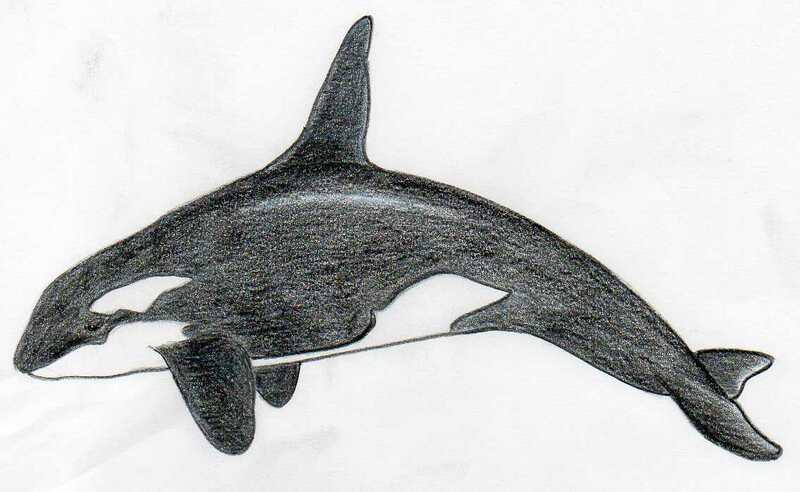 That propeller (air-screw) is called: "Take-Koputaa", which means in Japanese: "Bamboo-Copter". Add two small pupils into the eyes, just leave them blank for now. 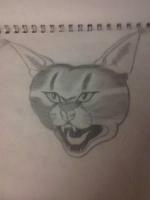 Sketch the whiskers. Outline the jingle-bell on Doraemon's neck collar. Use a well sharpened pencil or black color pencil, both are OK, and draw a clean and distinct contour line around Doraemon. Refine the details around and inside his mouth. You have now mastered how to draw Doraemon. 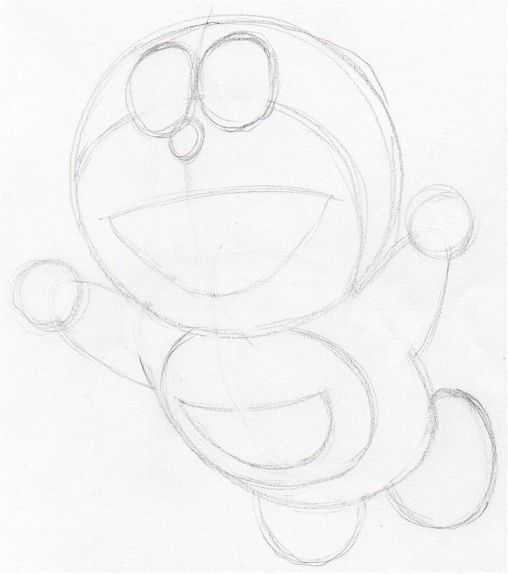 Just a while ago it was only a finished rough sketch, and here you have a completed Doraemon coloring page base. Make sure you erase all unnecessary pencil guidelines. You should now have a crisp clean contour drawing of Doraemon. Notice that there are only 3 colors used for Doraemon. Color all blue parts first. Next, color out the red parts. Just flat plain color, no shading yet. Push the pencil gently. 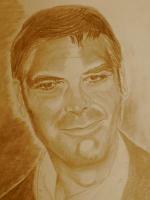 Color the yellow parts and draw a distinct black color contour line as you see on this picture. 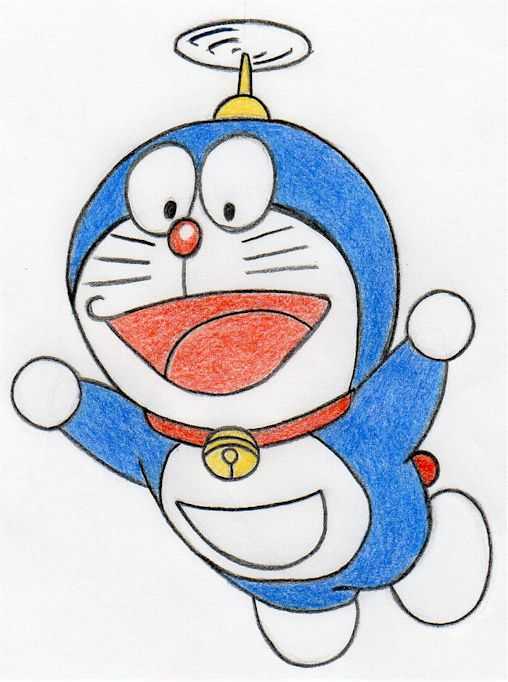 Black color contour line will create a clean and crisp image of Doraemon. Finally draw a sky blue background to make an impression that Doraemon is flying up high. 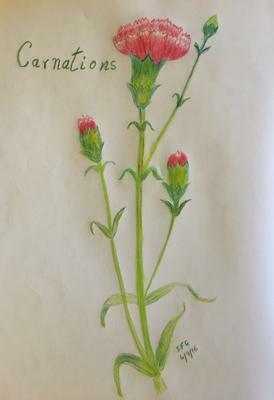 I hope your drawing looks pretty cool. You've learned how to draw Doraemon. 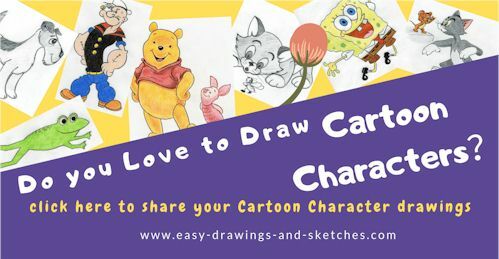 Upload your Doraemon drawing by clicking the banner below, and share your work with other visitors.